ON SUNDAY I ATTENDED morning worship services at Peace Lutheran Church in Echo, the sister congregation of St. John’s Lutheran Church in Vesta, the congregation of my youth. St. John’s members have been worshipping at Peace since a July 1, 2011, series of downbursts with wind speeds of 90 – 100 mph ripped the south roof from the sanctuary. St. John's, hours after the July 1 storm tore through Vesta. Photo courtesy of Brian Kletscher. 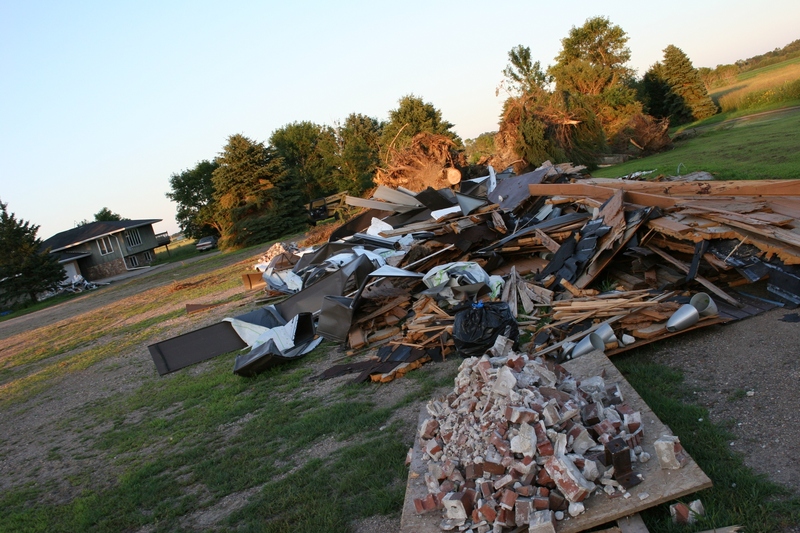 Just to the north, west and east in this region of southwestern Minnesota, EF-1 tornadoes with winds of 95 – 105 mph wreaked havoc on farms and on the neighboring community of Belview. Eight months later, St. John’s is still in the process of rebuilding. Eight months after the storm, St. John's is still under construction with a new addition to the right. Congregants had hoped to be back in the church by Easter, but that likely will not happen until May. 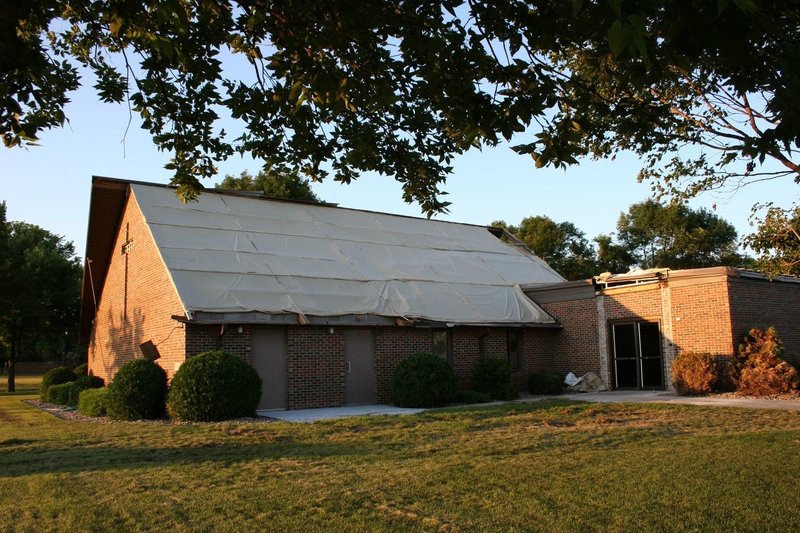 The narthex was expanded and a pastor's office and handicapped accessible bathroom were added on the southwest side of the church built in 1974. This photo and the one above were taken on Saturday. Despite the inconvenience of driving additional miles to worship and the temporary loss of their church home, St. John’s members realize the situation could have been so much worse. 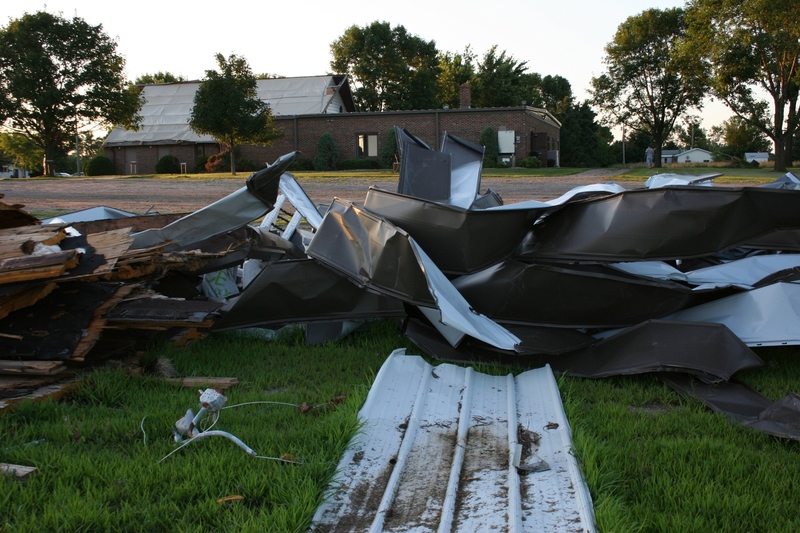 No lives were lost in the storms and their church could be salvaged. This we—visitors and members of the two sister congregations—understood as we bowed our heads to pray for the survivors of the recent deadly tornadoes. THE ARMLESS JESUS stood there, shoved into the back corner against a desk in the dark fellowship hall packed with misplaced pews. That’s when I panicked, thought for a moment that Jesus had lost his arms in the July 1 storm, until I realized his appendages had been removed, not broken. To the right in this photo, stands Jesus. His arms were removed and lie behind him on a desk. 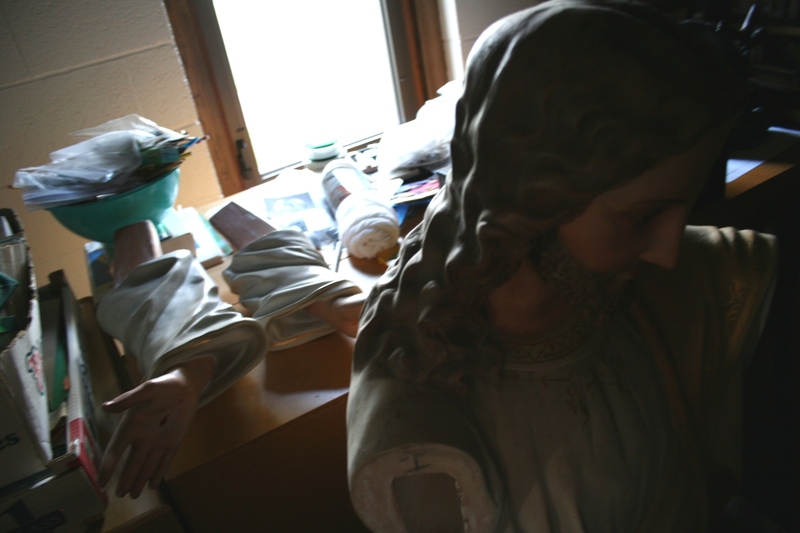 The statue of Christ has been my greatest concern ever since a series of downbursts with winds of 90 – 100 mph ripped half the roof from St. John’s Lutheran Church, exposing the sanctuary and Jesus to the heavens. 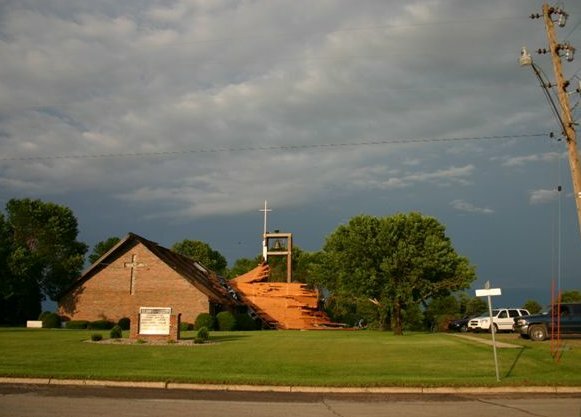 One month after that strong windstorm, I returned to my hometown of Vesta in southwestern Minnesota and viewed the damage I’d only seen in photos. The town looks better than I’d feared, although I’m certain if I’d been there right after the storm, I wouldn’t be writing that. St. John's, hours after the July 1 storm with half of the south roof ripped off by high winds. The roof fell against and cracked the bell tower, which has since been taken down. Photo courtesy of Brian Kletscher. It’s the damage to St. John’s that I knew would impact me the most emotionally. My worries centered on that Jesus statue, the single remaining visual reminder of the old 1900 church building across town where I was baptized and confirmed and worshipped for the first 18 years of my life. 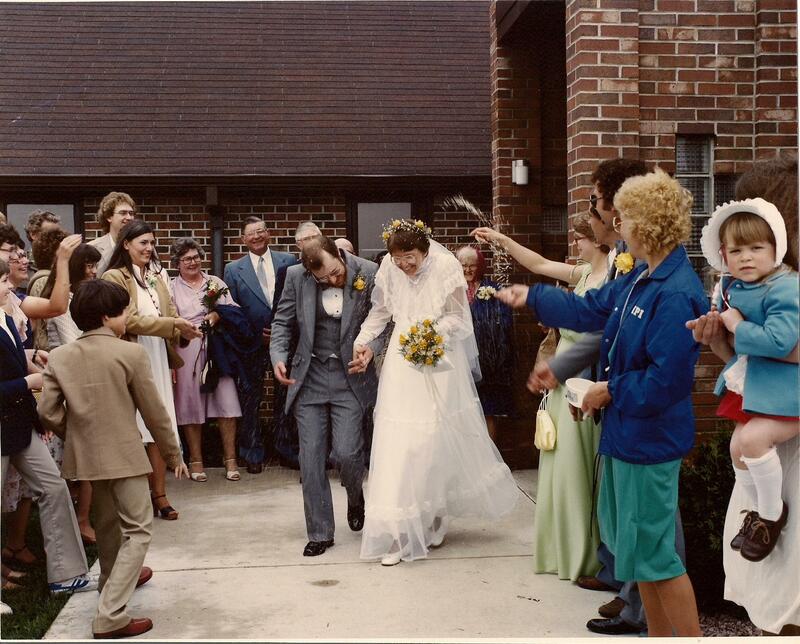 In May of 1982, I was married in the new brick church built in 1974. Jesus, who once blessed us with outstretched arms from the altar of the old church, was alright. For that I was thankful. As St. John’s members await word from an engineer on whether the damaged building is structurally-sound or will need to be demolished, they are attending their sister church, Peace Lutheran, in Echo seven miles to the north. That seems to be working for now. 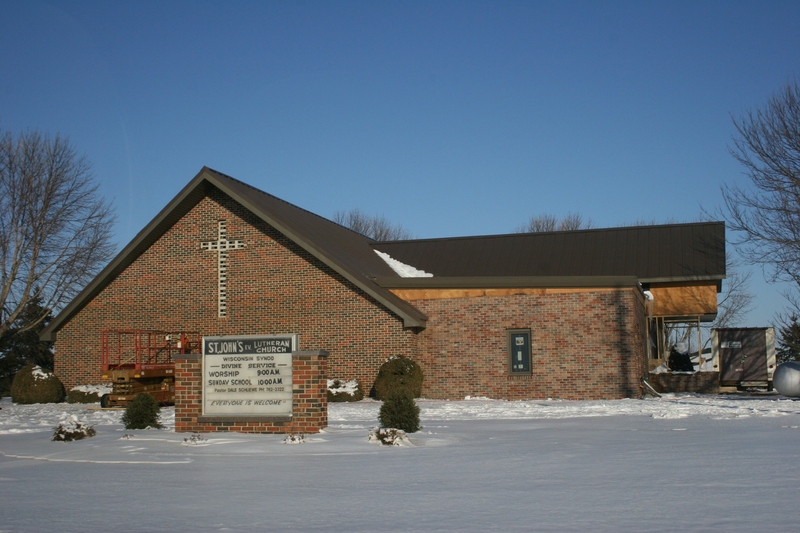 But come winter, when travel can sometimes be difficult and dangerous on the southwestern Minnesota prairie due to blowing snow, options to worship in Vesta may need to be considered. Or maybe not. 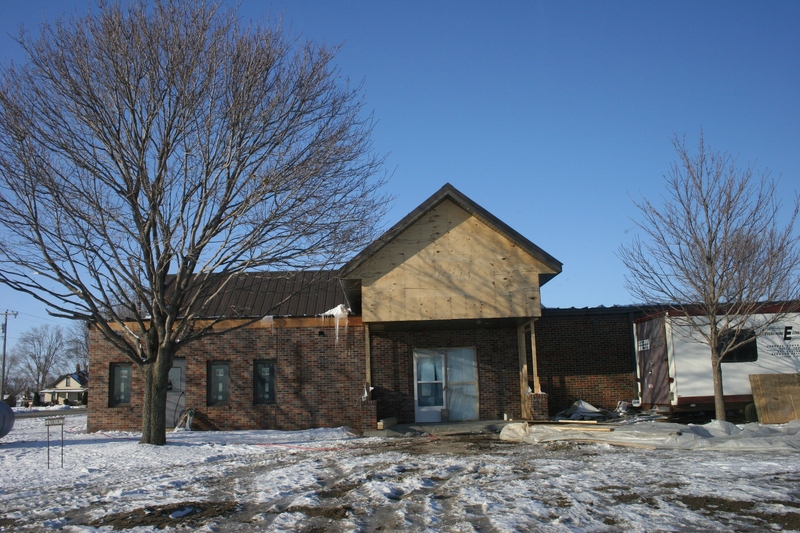 Pastor Dale Schliewe doesn’t expect the church to be rebuilt by the time the snow flies. Right now, though, church members are more concerned about getting the building process started. That could include an expansion. No matter what ultimately happens, this congregation remains a thriving one, attended by many members of my extended family. My great grandfather, Rudolph Kletscher, helped found St. John’s. The first church service was held in his home one mile east of Vesta. My emotional attachment to this congregation runs deep, rooted in that legacy of faith passed from generation to generation. I understand that a building does not comprise a church. Yet, when I walked into the empty sanctuary of St. John’s, gazed upward at the tarp covering the missing roof, saw the splintered wood, walked around the pews jammed into the fellowship hall, noticed Jesus standing armless in the corner, spotted the hymnals stacked on a kitchen counter and skirted the pile of debris in the church parking lot, my soul ached. 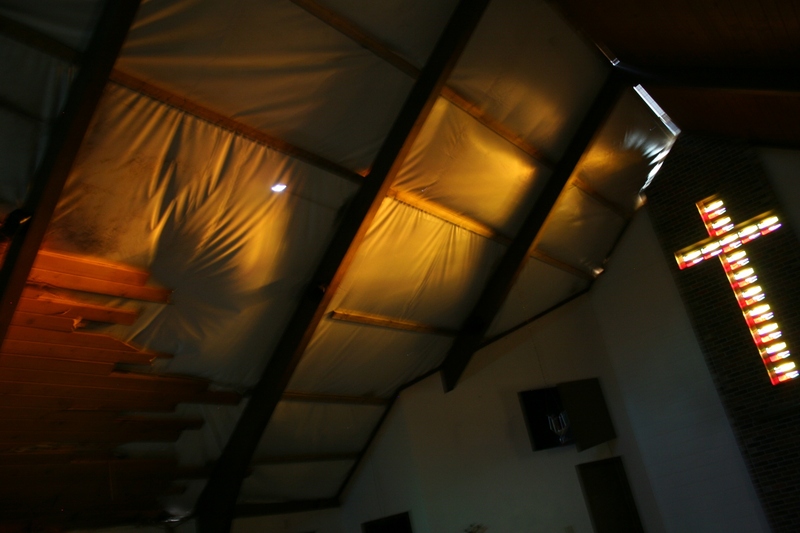 Inside the sanctuary, you see the damage to the roof, now covered by a tarp. To the right, a stained glass cross centers the worship area in this photo shot at an angle. One month after the storm, the south side of the roof is covered with a tarp. A debris pile on the edge of the parking lot includes pieces of steel from the roof and brick from the bell tower. Another angle of that debris pile shows uprooted trees and, to the east, a house which was damaged. ON THIS DATE 29 years ago, I married my sweetheart. And, yes, May 15, 1982, was also opening weekend of fishing. And, yes, several guests did not attend because they chose to go fishing. Others were in the field. During the reception at the community hall, we were whisked away for awhile to the municipal liquor store across the street. Then, later, after supper, we danced the night away with family and friends. Today we celebrated by shopping at a home improvement store. Pretty pathetic, huh? Not too worry, we’re also planning to dine out. And even if we weren’t, the most important part of every anniversary for the past two decades and nine years has been that I am with my husband. I have one question, though: How did nearly 30 years pass so quickly?